The GreenLight total viable count (TVC) method, which automatically detects microbial contamination in food and beverage samples, was recently validated and certified by MicroVal for raw meats and poultry. Based in The Netherlands, MicroVal validates and certifies alternative microbiological analysis methods according to EN-ISO 16140. "After a successful launch in the United States, the MicroVal certification will now enhance our ability to market GreenLight series instrumentation across Europe. The rigorous independent testing that this methodology has gone through over the past two years, gives European food processors the confidence to convert to faster, more efficient technology," says Dr. Richard Fernandes, chief executive officer, Luxcel Biosciences Ltd.
GreenLight sensor technology was developed by Luxcel Biosciences and has been marketed in the United States by MOCON, Inc. since 2010. The methodology has been previously qualified by AOAC International, Gaithersburg, MD, which provides validation and conformity assessment of commercial and analytical methods. 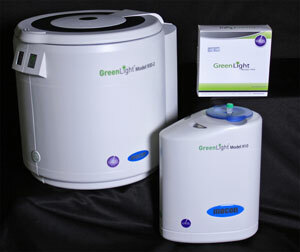 The GreenLight series was developed to provide precise, same-day results in a cost-effective manner. Depending on the bacterial load, results can be obtained between minutes and 12 hours. This is more than ten times faster than the traditional agar plate or film methods, which typically require 48 to 72 hours to achieve a meaningful microbial count. Shorter testing cycles provide packers and processors with the potential of getting their perishable food items to the consumer in less time. "The rigorous independent testing of the GreenLight microbial test methodology provides further validation of its ability to perform precise tests for bacterial loads in raw meat and poultry. Additionally, GreenLight's outstanding time-to-result when compared to traditional methods enables us to play a key role in creating a safer world market for food," Dr. Fernandes says. Three different units, the GreenLight 910, 930 and 960 are available to handle a variety of throughput requirements. The series also targets company and laboratory microbial contamination testing requirements for seafood, dairy, produce, etc. MicroVal is a European certification organisation for the validation and approval of alternative methods for the microbiological analysis of food and beverages. MicroVal validates and certifies alternative methods in order to show that such proprietary methods perform equally well as traditional, internationally standardised methods. MicroVal certification of alternative methods will ensure their acceptance by governmental inspection laboratories and laboratories in the food trade, throughout Europe, thus facilitating commerce within the European Union. For more information, visit www.microval.org. Based in Co. Cork, Ireland, Luxcel Biosciences was founded in 2002. The company has won several industry awards, including the prestigious all-Ireland "Young Company of the Year" Award, and the Small Firms Association (SFA) of Ireland "Innovators of the Year" Award for companies with 250 employees or less. Luxcel's customers range from major global pharmaceutical companies and leading processed food manufacturers to biotechnology companies. For more information, visit www.luxcel.com. MOCON is a leading provider of instrumentation and consulting and laboratory services to medical, pharmaceutical, food and other industries worldwide. For more information, visit www.mocon.com.